My family moved to South Carolina when I was in elementary school. We knew nothing about the American South or its history. Image of the South Carolina Statehouse taken in 2007. The Confederate flag was removed from the Statehouse in 2015 after nine black parishioners were murdered in a mass shooting in Charleston. Photo courtesy of Jimmy Emerson. For 20 years, we lived in Columbia, South Carolina where the demographic was primarily white and black, with a very small Asian community. In elementary school, I had mostly African-American friends. I later realized the two main elementary schools were segregated. Bradley elementary was 80-90% African-American and Satchel Ford elementary was 80-90% Caucasian. The school district placed me at Bradley, because it had an English as a Second Language program. There were not many other Asian families in the area. I remember coming across a couple of other Asian girls, but at the time, I didn’t want anything to do with them. I didn’t want to be thought of as a typical, “fresh-off-the-boat”, prim and proper, nerdy, non-athletic Asian girl. I wanted to fit in and be like the other black and white students. I joined the basketball team, school band, and participated in drama club. My white friends would give me backhanded compliments such as “I don’t even think of you as Asian.” Although they told me this, I knew they saw me differently than our other friends. In spite of this, I integrated to life in the South pretty quickly. I picked up a southern drawl. I said, “Yes, ma’am” and “No, sir.” I called people "Honey or Sweetie.” I learned to pray before eating meals at my friend’s house. I went to the skating rink on Friday nights and the mall on Saturday nights. (left to right) My sister, me (in high school), my sister’s son, and my mom at our Chinese restaurant in Columbia, SC. Photo courtesy of Wai Yi Ng. My mother on the other hand led a completely different but parallel existence. She only spoke a few words in English and stood out as a practicing Buddhist. She worked until 11pm every night, except for Sundays. My mom was not able to take me to any of my basketball practices and none of my games. I ended up quitting the team before the season was over. My junior year of college was when I first learned about climbing. I learned to lead climb, sport climb, trad climb, and boulder. I threw myself into climbing and progressed quickly; it was my new obsession and I suddenly found myself with a new group of friends. Yes, they were also white, but, instead of standing out or feeling invisible, they treated me like I was one of them. After growing up in the South, it felt like a reprieve. I thought to myself, climbing must not have racism, sexism, or homophobia. The climbing community felt like a safe place where everyone was accepted. My life became all about climbing and I was good at it, so I felt like one of the climbers. 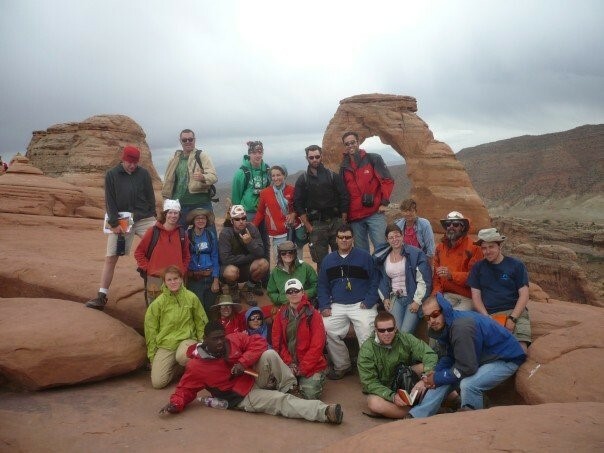 Geology Field School at Arches National Park in Moab, Utah during my last year in college. I’m pictured here along University of South Carolina and University of Georgia students. Photo courtesy of Wai Yi Ng. After a few years of climbing in the south, I moved to Honolulu, Hawaii. Honolulu was a complete culture shock. For the first time, I was surrounded by people that looked like me. I wasn’t the only Asian girl, I was one of many Asian girls. Part of me was sad; I wasn’t special anymore, I wasn’t unique or different. I was forgettable, I could blend in. Ironically, this is what I always wanted to be. I immediately got a job and moved into a small plantation home. My neighbors were no longer Caucasian or African-American. They were Filipino, Chinese, Japanese, Hawaiian, or Hapa (half Asian and half Caucasian). For the first time, I had more than one Asian friend. For the first time, I was no longer someone else’s only Asian friend. Once I settled in Honolulu, I lost my southern drawl (mostly). I stopped saying "Yes, sir” and “No, ma’am" and started saying "Aloha and Mahalo." I became comfortable living in my Asian majority surrounding and only returned to South Carolina once a year. The climbing community in Honolulu is much different than other parts of the United States. It is diverse with a large Asian and a large women’s climbing community. I finally found a place where I really do fit in. I found a comfort that I hadn’t realized I needed. Photo of myself along with college friends at the University of South Carolina. Photo courtesy of Wai Yi Ng. Although climbing is our safe place, we still need to talk about those tough subjects and work together to improve our community. We need to educate—not only others, but ourselves and our families. We need to stop segregating our children. We need to teach them that climbing and other outdoor sports are not only a white man's sport. That means raising children who are comfortable outdoors and working towards change. It also means volunteering or creating an organization that provides an opportunity to get all people into the great outdoors, not just the privileged.